Step up the look of your 2010-2013 Mazdaspeed 3, while increasing the cold airflow through your top mount intercooler (TMIC) with the latest version of CorkSport"s Carbon Fiber Hood Scoop. #ZoomZoom! The sweet lines of the CorkSport Hood Scoop is sure to set your Speed3 apart from the crowd and turn heads. We engineered it for an exact fit, so it integrates nicely with your MS3. We also went to the extreme to ensure our re-issue of the hood scoop surpassed our quality standards at no extra cost to you. We have to say, we really outdid ourselves on this one. 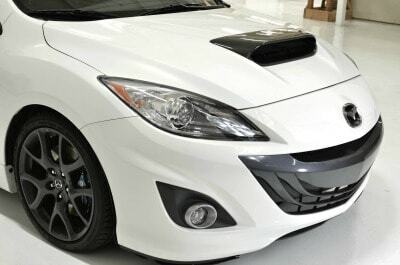 Looking for an alternative if you plan on painting or vinyl wrapping the hood scoop? Check out this listing for more details. Check out the video and installation instructions below. Share your performance review with the CorkSport community once installed! Material: Made from fiberglass and overlayed with real carbon fiber cloth. Sealed with UV-resistant, epoxy resin. Finish: Polished carbon fiber to a mirror-like finish. Performance: The CorkSport Carbon Fiber Hood Scoop has a 52% larger opening compared to the factory hood scoop, providing an extra dose of fresh cool air to the TMIC. Strength and quality: The CorkSport Mazdaspeed Carbon Fiber Hood Scoop is handcrafted using the finest materials. Larger scoop: More than 1 inch larger than the factory hood scoop. Improved airflow: Allow your engine to open up and breathe the cool, outside air. Upgraded Top Mount Intercooler: Designed to work well with the upgraded Mazdaspeed TMIC. CorkSport service and support: full color installation instructions, all necessary components, and knowledgeable telephone support at 360-260-2675. Note: We take pride in our work and products. Your CorkSport Carbon Fiber Hood Scoop is unique to you. Slight imperfections are normal, such as tiny bubbles or wavy weaves. They are not a reflection on the quality of the product or functionality. 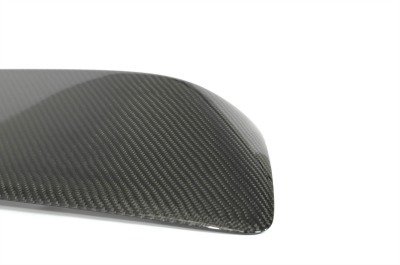 It will take you about 30 minutes to install the carbon fiber hood scoop with our easy-to-use instructions. Easy to Install, install mine on my 2010 Speed3. your factory washers will be useless, install new hood scoop without washers after talking to tech support. Also you will probably have to get new push clips, 2 of mine crumbled on removal. Looks awesome. LOVE the look. Easy install. But please beware- winter/snow drivers - the bolts WILL RUST. i have had 4 screws completely fall out. Not too happy about this. Best i got was 5% off a new one. Wish they would have done something since i see this as a design flaw. I am giving it a 3 because i love the look, -2 stars for Customer Service with CS. Boo. Great quality, very simple installation, MAKE SURE TO HAVE SOME BACKUP NEOPRENE WASHERS, because the factory ones stick and rip, or crumble, and are just sh** all together. Other then that everything was great, and looks good! I have a VIS Racing carbon fiber hood and didn't know if the CorkSport hood scoop would fit. Since I have just about every part that CorkSport makes and have never once had a fitment or quality issue, I decided to take the risk and place the order for the scoop. The VIS hood took about 10 minutes to modify in order to fit the CS scoop. Just had to widen the holes for the CS scoop screws. I also tested the scoop in my factory hood and didn't have any fitment issues. The CS scoop looks incredible and the quality far surpasses the original VIS scoop that came with my hood. Thanks CorkSport for another incredibly high quality product! 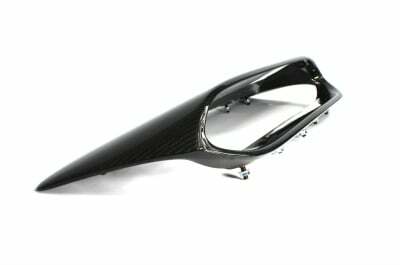 Great looking scoop, very sturdy, it has lasted through a couple runs over 145 mph unlike some of the other parts of the body. you can see the scoop from the inside of the vehicle and I am very pleased with this product. Just came in, detailed instructions, only took 30 min to put on!! Nice quality and looks great!! Awesome great boost more to target with Cobb ap etc great product cs like always and delivers like said and Performance. this is only available for purchase next year in February? will it come with replacement washers? I put it on about a year ago...So many angry Subbies.... AP shows pretty much ambient air temp all the time for the intake temps....even in traffic. never had a problem with it in extremely heavy rain....I park on a downslope all the time...just don't know....but ....paired with the ram intake/FMIC.....lots of compliments and very clean look. Great stuff...when u can still be happy over a year later. This scoop looks awesome. It was easy to install and fits great. This scoop allows a lot of airflow and it can be seen when driving. I have caught myself walking up to my car from the front just to look at it. Really nice addition. Thanks Corksport. Super lightweight. Love the look. I will echo Randy's comment on the washers. Either supply new ones with the purchase or make it plainly known to the consumer that they will probably want to ensure they have some on hand. I was only able to salvage 7 of the 10 stock ones and had to make a hardware store run as well. Looks Great both from the exterior, and the fact that I can now see my hood scoop from the driver position I love it. I have a 2011 only issue I have is in the instructions it states to take the Foam washers off the stock scoop and place them on the aftermarket CS scoop. They were dry and destroyed they crumbled in my hands. Maybe supply these foam washers so that someone doesn't have to go to Home Depot late at night looking for washers as I did. Can you tell me the area of the opening? how much does this hood scoop weigh?? Does this come with a "grill"? With a larger opening, is it more likely to catch more debris into the engine bay and TMIC? Do you guys provide a mesh insert in the opening of the scoop so that debris cannot enter the engine bay through it? We will have some available that can be used for painting purposes. Can I preorder this scoop? 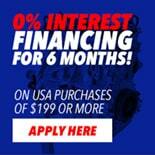 Give us a call at 360-260-2675 and we can get you set up with one! Do I have to get it clear coated when I get it. I just bought it and would like to know before it arrives. It is a good idea for better protection against UV. How smooth is the transition from the back of the scoop (opposite the opening) to the hood? If there is a gap or abrupt edge, how big is the gap or edge? The fitment of the hood scoop on the back edge is like stock. I'd describe the rear fitment as 'clean' but it's not as stock. It has a 'bubble/bulge-like' protrusion out of the hood in appearance from all perspectives. You can get it in factory white if you bring it to a local paint shop. We do not paint the hood scoops.